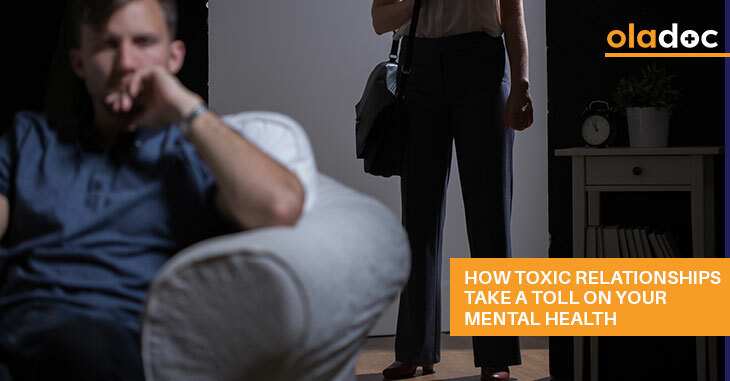 Home » Mental Health » How Toxic Relationships Take A Toll On Your Mental Health? Similar to toxic food or drink that can take a toll on our physical health, toxic relationships can also affect our mental and physical health. These toxic relationships come in many forms—from partners, to spouses, to family members, and even friends and co-workers. In a study, spanning 12 years and following over 10,000 people, researchers discovered that people dealing with toxic relationships were at a higher risk for developing anxiety, depression, and even heart disease. At the same time, we cannot say that any relationship is free from conflict and disagreement. However, there are certain answers that can help you figure if you are in a toxic relationship. For instance, ask yourself if you feel content in their presence; after spending time with them, do you feel better or worse about yourself? ; do you feel emotionally safe? ; is there a give and take in the relationship, or are you the one compromising all the time? These are some questions that can help you define a toxic relationship for you. Dealing with a toxic person can destroy your confidence. It makes you question your self-worth and infact you start blaming yourself for something you had no control over. Moreover, it can make you question your decisions and you feel more dependent on others’ point of views. When you are around a toxic person, you would automatically feel anxious and stressed. Your body would respond to this stress by releasing hormones that in the long-term can be detrimental for health. You should never put yourself second for anyone—nobody’s care should come before you. Toxic people know how to make themselves a priority for others; and if you are dealing with a toxic person, you would find that you are ignoring yourself for their needs. Taking care of someone you love is different from putting yourself second for a toxic person. If a relationship does not operate on equality and mutual respect, it can soon morph into a toxic one. If you allow yourself to be in a disrespectful relationship, you would start allowing other people to disrespect you too. It can thus take a toll on your self-esteem later on. How to deal with toxic relations? The first step is acknowledging the toxicity that the relationship is bringing. According to a psychologist, Susan Bartell, PsyD, if you are not acknowledging that your relationship is not going well, you will deal with anxiety, sleep disorders, depression and low self-esteem. She further adds that people in their 20s and 30s are more vulnerable to toxic relations because they are less secure and stable in this age than older people. One way to deal with toxic relations is to address this issue right away. According to Dr. Bartell, it is a good idea to talk it out with your partner if he or she is going through something, so that you can help them overcome it. If however, you have to deal with a constant litany of critique, negative talk, and blame, then you might be dealing with emotional abuse. Being in a toxic relationship can take years to recover from. If you are, or ever were in such a relationship, then find professional help for your mental health. Book an appointment with a top psychiatrist in Lahore, Karachi and Islamabad through oladoc.com, or call our helpline at 042-3890-0939 for assistance to find the RIGHT professional for your concerns.